The Type 81: China Has Its Very Own AK-47? In the 1980s, China’s small arms were largely inferior to the United States and Russia. The PLA was mostly armed with the Type 56 assault rifle, a clone of the original AK-47, and the Type 56 carbine, a clone of the Soviet SKS. There was an abortive attempt to combine the characteristics of these rifles in the 1960s which culminated in the Type 63, an SKS-looking select-fire rifle that used elements of the AK operating mechanism such as a rotating bolt and fed from AK magazines. The Type 63 was too heavy and lacked a pistol grip and inline stock to afford controllability in fully automatic fire. It was an outdated rifle when it was introduced, especially compared to the American M16 and Soviet AKM. 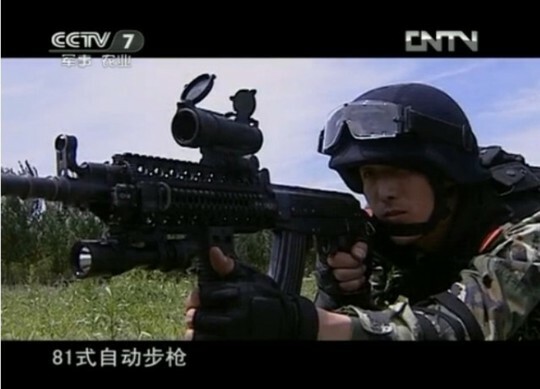 The PLA realized this and began development of a new 5.8mm caliber the rifles for it, which eventually became the QBZ-95. However a “stopgap” rifle was needed, to quickly replace the Type 56 AKs. From this requirement, the Type 81 was born. The Type 81  was not meant to be just a rifle. It was meant to be a test of the Chinese ability to develop small arms on its own, instead of simply adapting other designs. Unlike the Type 63 carbine before it, the Type 81 used a gas system of purely Chinese design. It also addressed flaws of the earlier rifles in light of combat experience in the Sino-Vietnamese war. In an attempt to make the rifles more modular and adaptable, the integral folding bayonet of the Type 56s and Type 63 was scrapped in favor of a removable knife bayonet and the provision to mount an underslung grenade launcher. The barrel was also lengthened and given a spigot to allow the Type 81 to launch rifle grenades. It also featured a novel sighting system, ditching the AK and SKS rear leaf sights in favor of a shielded aperture that resembled the early M16s. The earlier Type 56 assault rifle was also considered to have too poor accuracy in single fire mode (oddly, contrary to the Soviet experience in the 1950s). This flaw was also in the minds of Chinese designers, who specifically designed the Type 81 to be more accurate than the Type 56, utilizing a short-stroke gas piston system as opposed to the long-stroke used in the Type 56. The barrel manufacturing techniques were also improved, and the barrel itself is longer relative to the Type 56 assault rifle. The end result was an impressive fusion of designs. The Type 81 was reliable, able to shoot around 15,000 rounds on average without parts breaking or needing replacement. It was more accurate than a standard AK in 7.62x39, with less recoil. The provision for soldiers to launch grenades two different ways was added. Apart from some early issues such as the sight zero being thrown off by launching rifle grenades, the Type 81 was loved by the soldiers who were issued it. It saw its first action in the Sino-Vietnamese border conflicts. Despite its success, in the end, the Type 81 was still a stopgap rifle. What the PLA really wanted was a rifle in a new true intermediate caliber: 5.8mm. As this caliber started to reach maturity, some versions of the Type 81 were chambered in it as testbeds for the new caliber. It was eventually replaced in frontline PLA service by the QBZ-95. That wasn’t the end of the road for the Type 81 though. It continues to see service in the People’s Armed Police, upgraded with Picatinny rails  that allow it to mount modern optics, and has proven to be an adaptable design. When a new series of Chinese DMRs  were revealed around 2015, they too were derivatives of the Type 81 design, despite the new name of CS/LR-14. These new DMRs are the Chinese answer to compete with other 7.62 DMR rifles such as the FN SCAR and SR-25 on the global export market. China’s 1980s stopgap rifle may continue to see service far into the twenty-first century.